Organic Rose Geranium, Roman Chamomile and Lavender. Pamper your skin with a cooling and ultra-soothing rehydrating lotion that helps to replace lost moisture and rebalance the skin after exposure to the sun. 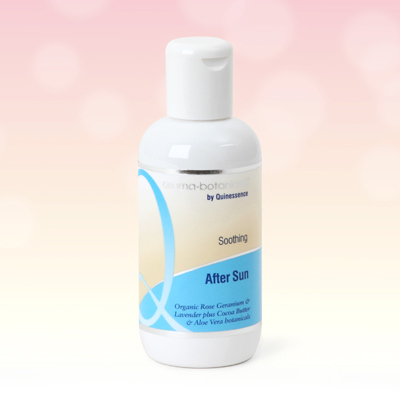 Regular use of this light and rapidly absorbed lotion helps to promote soft, comfortable skin that is much less likely to peel and help save your skin from the inevitable signs of sun damage. Aroma-botanicals After-Sun Lotion contains an expert blend of organic essential oils to restore balance and calm any red, irritated or over-exposed areas of skin likely to suffer damage caused by UVA rays. The legendary healing powers of Aloe Vera work in perfect synergy with our blend of essential oils to effectively reduce the painful consequences of over exposure to the sun. The effects of exposure to UVA rays together with hot dry air, wind, and possibly overheating the skin demands swift action to prevent that aging weather-beaten look. So we’ve enriched this rehydrating lotion with indulgent Cocoa Butter, which is rich in the fatty acids that deep-nourishes and repairs dry, cracked skin. Cocoa butter is a fantastic source the antioxidants that combat free radicals and help fight signs of aging and environmental stressors. Aqua, Prunus Amygdalus Dulcis, Caprylic/Capric Triglyceride, Polysorbate 60, Aloe Barbadensis, Ethylhexyl Palmitate, Cetearyl Alcohol, Glycerin, Sorbitan Stearate, Cocos Nucifera, Pelargonium Graveolens c.v Rose, Aleurites Moluccana, Theobroma Cacao, Alcohol Denat, Lavandula angustifolia, Anthemis Nobilis, Carbomer, Pogostemon Cablin, Disodium EDTA, Mentha Piperita,Camellia Sinensis, Betula Alba, Potentilla Erecta, Thymus Serpyllum, Vaccinium Myrtillus, Gluconolactone, Sodium Benzoate, Calcium Gluconate.